In a bowl, soak the black fungus in boiling water until it has softened. 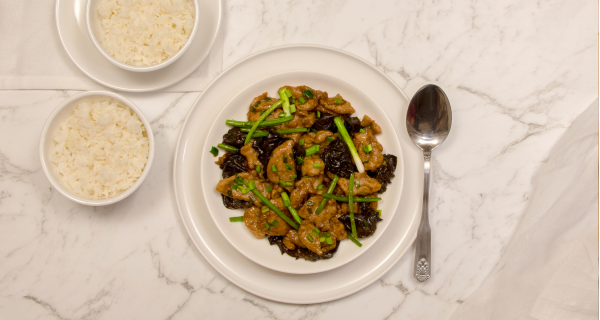 In a separate bowl, combine pork, Shaoxing wine, sugar, 1 tbsp light soy and cornflour. Coat the pork thoroughly. Let it marinate for 5 mins. Cut the spring onion and celery into 5cm batons and chop the garlic chives. In a wok, add 1 tbsp oil and sauté ginger and spring onion until the mixture becomes aromatic. Add pork and cook until browned (about 4 mins) before removing from wok. Put 1 tbsp of oil into wok and add black fungus. Stir fry until heated. Add the remaining light soy and oyster sauce and combine. Add the pork mixture back to the wok with vinegar, sesame oil, chicken stock powder, celery, spring onions and garlic chives. Cook for 2 mins before serving.